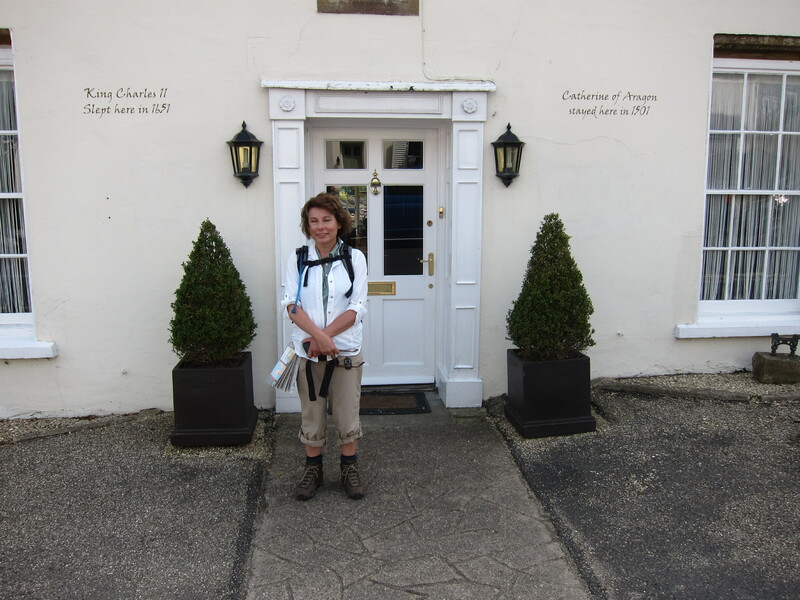 Coast Walk – West Bay to Seaton. Today was probably the most physically demanding I have done so far, although not the longest. We had a fairly leisurely breakfast then took a taxi back to the coast at West Bay. I could see the very tricky final steep slope from yesterday. The weather was very overcast and threatening. Fortunately Tom had a spare cagoul in the car which he has lent me for the rest of the week. Hopefully it won’t be needed, and, in fact, although it threatened a few times there was no rain all day. The path crosses the harbour then immediately begins to climb up towards the cliff top, before dropping right back down to the sea at Eype Mouth. From Eype, the path appears to go straight up from the beach, but after a minute of scrambling up a bit of landslip we were waved back by a passer-by who pointed out the very insignificantly marked diversion. Regular landslips make the coast path a bit of a moving feast. 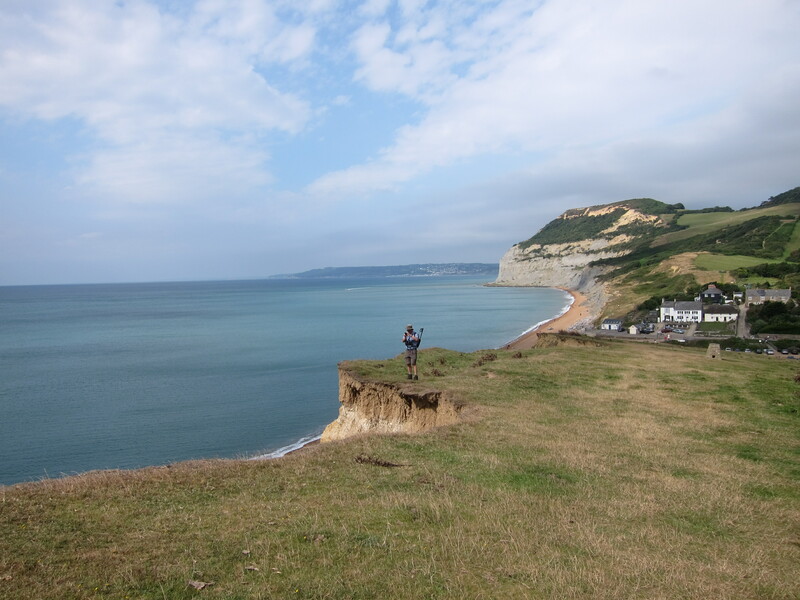 There is a steady climb out of Eype to Thorncombe Beacon – a long pull with a grassy saddle down and up again about half way. The view was excellent, we could just see back to Portland Bill where I started yesterday. Off the beacon there is a moderate slope down, then up again to the highest peak on the South Coast – Gold Cap. It is not a hard climb, but relentless. On the way down we were treated to the sight of a kestrel. Down again into Charmouth, where there is quite a long diversion round the back of the town, along the old high street – again full of interesting houses from different periods. This street boasted a property where not only Charles II stayed (we are still on the Monarch Way, as well as the coast Path) but also Katharine of Aragon on her arrival from Spain in 1501. The path climbs through a patch of woodland before arriving at the golf course at Lyme Regis. We nipped across the greens between balls and then dropped down into Lyme. I can only assume that the rest of the country was completely deserted today as everyone was in Lyme. The sun had come out and it was a warm afternoon. There were mums, dads, grandparents, sons, daughters, dogs, nieces, nephews, cousins and aunties traipsing round, eating ice-creams and poring over the fossil and mineral collections in many of the shops. Tom is interested in minerals so we went into a few shops and he purchased some specimens. I was amazed at some of the fossils – tiny, delicate outlines like Raphael drawings, tens or even 100s of millions of years old. All of the little boys were delighted with the various bits of dinosaurs. Lyme for me is famous for the scene in Persuasion, where Louisa Musgrave is knocked out on the Cobb and Anne Eliot, my favourite Austen heroine, has the pain of seeing the lover she broke up with 8 years before apparently in love with the said Louisa. Out of Lyme, I crossed into a new county – Devon is now before me. The path goes into an area called the Undercliff created by a massive landslide in 1839. Conveniently whilst the President of the Geological Society was staying there – coincidence, I am sure. 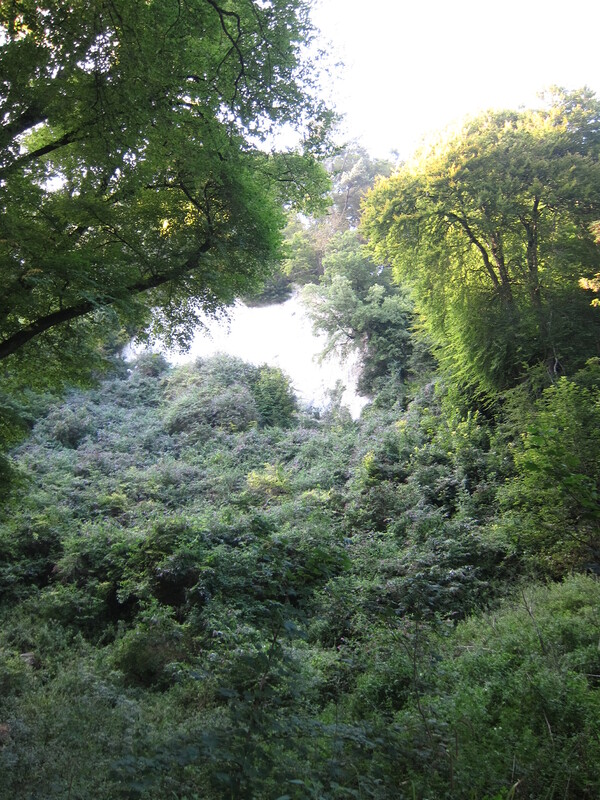 The land slide took away about 6 miles of cliff, which is now grown over into what is almost a tropical rain forest It is thickly grown over drops and chasms between the boulders. It is important to stick to the path as the area is still very friable. There are ferns and creepers all around, and occasionally a glimpse of cliff with a few where one can see out to sea, but for the better part of 6 miles the path is completely under the canopy of trees and undergrowth. We heard owls calling, and even a peregrine. By the end it seemed a little oppressive, and being quite hard going, I was glad when we reached the top of the headland. We walked through a couple of oat fields and dropped down into Seaton. A gruelling day, but fantastically varied. 18 miles. We had an excellent pub meal in the Winston, then I said goodbye to Tom for a day by myself before Bridget and Angela join me.